“It has taken five records to make one that sounds the way we do onstage,” says White Denim frontman James Petralli, explaining the bandʼs new full-length Corsicana Lemonade. 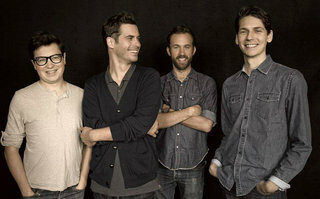 Set for release October 2013 via Downtown Records, Corsicana Lemonade puts White Denimʼs freewheeling stage ethos to wax and cements their position as a quintessential, unique American rock band. Featuring production on two songs and a full mix from iconic songwriter Jeff Tweedy, itʼs a revelation, merging the group's manic live virtuosity into a rollicking ten-song mission statement. The Austin, TX four-piece is no stranger to mixing crunchy punk energy, scorched psychedelia, Southern rock and knotty funk, but Corsicana Lemonade, the groupʼs fifth studio album, naturally covers so many bases that it plays like the greatest lost mixtape you could find on your dashboard during a hot summer afternoon. (2010) and noisy sun-soaked sizzle of Fits (2009) to the soft-edged riffage of D (2011), the groupʼs commitment to fiery live performance, odd time signatures, textured exploration and blissful interludes has never wavered. It peaks on Corsicana Lemonade. Album sessions started in Chicago at fabled Wilco compound The Loft with Jeff Tweedy (and frequent production partner Tom Schick) manning the boards and providing motivation. The record was almost entirely recorded live with full-band takes, ensuring a lived-in live feel. "Before, we had kind of leaned on the ability to give the impression of a full live band on our recordings. That Protools Rock is way more common than people know," says Petralli. "On Corsicana Lemonade, it was actually the band playing together and doing takes as a whole. Whatever sounded best was what we stuck with." After the Chicago sessions, White Denim returned to their native Austin, holingup in a house overlooking Lake Travis from a 100-foot cliff. There, with the help of local producer Jim Vollentine, the band designed a makeshift studio, wheeled in a bunch of crazy '50s gear and solidified the mixture of hard and classic rock elements that they began exploring on their fourth album D.
The recordʼs songs feel at home with the skuzzy rawness of contemporaries like The Black Keys or Jack White and the Americana experimentalism of Wilco, while the band cites the classic rock shuffles of Thin Lizzy and The Allman Brothersʼ instrumental ecstasy as primary influences. And now, with the support of leading publications like the New York Times, Rolling Stone, Pitchfork and Relix, as well as adoring crowds from Bonnaroo to their sold-out headlining tours, White Denim has fully arrived with a record to claim their own spot in America's great rock lineage. Corsicana Lemonade is available in October 2013 via Downtown Records. Catch the band at Austin City Limits this October and on tour with Tame Impala this fall. Planning a trip to the Island? Check our Live Music listings for Victoria @ LiveVictoria.com and the City of Victoria's ArtsVictoria.ca site for all other events.